Forgetful Heart is just mind blowing. Saw him do it in Adelaide two nights ago and it was amazing then too. I saw both his shows in Hamilton New Zealand, and then a couple years before that in Auckland. This tour is far superior to the one I saw a couple of years ago. I actually stood there stunned through out both nights. I had brought a lot of my friends who aren’t big fans they were just as as mesmerised as I was. 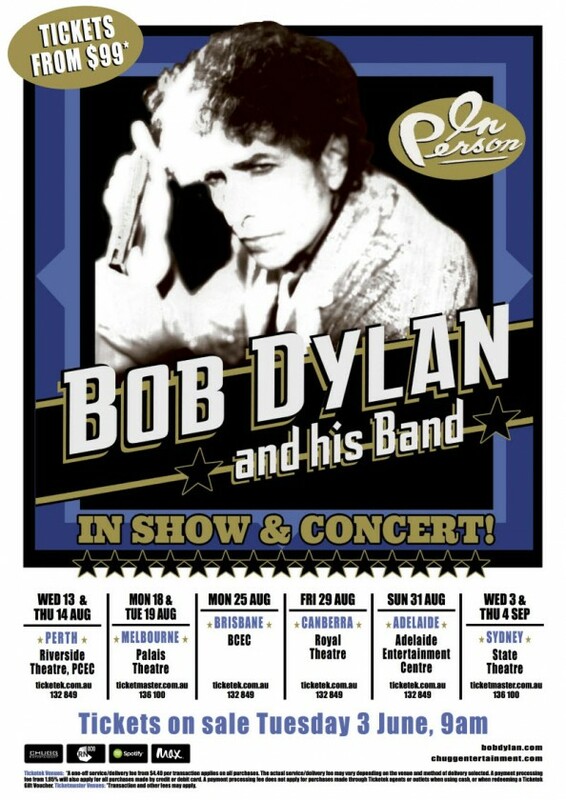 Roll on Bob!!! He is in his prime man. I listen to a lot of live Dylan from all periods of his career and I think this is his best. Thoughts Egil? I mean his voice isn’t clean like it was in 1980, or the band isn’t firing into it like in 66′ but when I saw this its Bob at the end of his road (or near too, fingers cross he makes it back too NZ) and all these songs have so many messages through them, this set is repeated for a reason. He has something to say and he is saying it now. With the flashing eye behind him that he himself crowned. I was stunned I heard every word and they all rung true Bob. Did you manage to see him this year Egil? I would love someone too post the new verse to Scarlett Town, really haunting. I like the touch of him ending with blowing in the wind. I mean it was obviously done because it was his first song to be received by the public. I took it as him saying I’ve told you the answers tonight do something with them. Much love as always Egil, I tipped toed around the matter in this comment but I am sure you will be able to guess what I am implying. Oh and one more thing I when I listen to Long and Wasted Years I always think that is the song for John Lennon. The song has a couple of Beatles references and other little lines that make me think of the big Lennon Dylan rivalry of the past. Is this just me? I thought fall 2013 was the best leg in many years, and all 3 legs this years have been great (have not heard a lot from this last leg yet, but what I’ve heard he still sounds Great). I caught the 2 concerts he played in Norway (July) this year – one Great & one not so great.